The Yatta-Tachi Noms: Sacher Torte from My Love Story!! Introducing our cooking series: The Yatta-Tachi Noms! Anime seems to excel in the art of making fans’ mouths water. Whether it is a simple omelet recipe or a masterful stew, our favorite series make us want to sprint to the nearest grocery store and start cooking. But, how the heck do you start cooking something you have no idea how to make? Well, that’s where The Yatta-Tachi Noms comes in! One of the best things about this anime is the food that Yamato makes. She is a fantastic baker, and Takeo loves her even more for it. 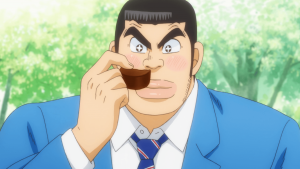 So, for our first recipe, we will be making the simply delicious “Sacher Torte” (or, as Takeo calls it, the Sacherotote). 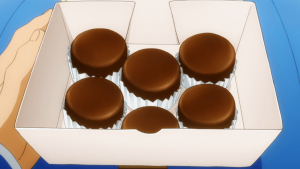 This dessert appears in episode two, “My Romance”. This dense chocolate dessert dates back to 1832 in Vienna, Austria. The original Sacher Torte from the Hotel Sacher recipe remains a secret to this day. Decadent chocolate cake is the base for the recipe with a layer of apricot jam and a chocolate glaze finishing it off. For the sake of time, pre-measure all dry ingredients. If possible wash used bowls and saucepans to eliminate clutter and expedite clean-up. 2. Butter the 9” spring form pan on all sides. Line the bottom with a sheet of buttered parchment paper. Dust the entire pan with a flour. Remove the excess. Set aside. 3. Separate the egg whites (medium bowl) and yolks (small bowl 1). Using the mixer, whip the egg whites at high speed until it forms soft peaks. 4. Sift together all-purpose flour, almond flour, and salt (dry ingredients) in the second small bowl. 5. Beat the softened butter and sugar until fluffy in the large bowl. Mix the egg yolks one at a time into the butter/sugar mixture until fluffy. 6. Whisk in the chocolate followed by the dry ingredients. Beat in ¼ of the egg white mixture. 7. Using a spatula, fold in the rest of the egg whites until there are no streaks. 8. Using the spatula, scrape the cake batter into the spring form pan and smooth out the top to make it even. 10. Insert a toothpick into the center of the cake. If it comes out almost clean (with just a few moist crumbs attached), the cake is done. If not, continue to bake, but check frequently. 11. Take out the cake and let cool on a wire rack for 30 minutes. Remove the spring form ring and let the cake cool completely. 12. Once the cake is cool, take a plate and place on top of the cake carefully. Flip the plate and cake together. Remove the parchment paper and turn the cake right-side up. 13. To make the apricot glaze, whisk together ¼ cup plus 2 extra tablespoons (30 milliliters) of the apricot jam with ¼ cup (60 milliliters) water in a small saucepan on a low setting until blended. Strain mixture to remove large fruit pieces. 14. Using a serrated knife, cut the cake horizontally into 3 even layers. 15. Cut cake out of the 3 layers using the small cake ring. The size of the cake ring determines amount of mini tortes this recipe yields. 16. Trim the edges if necessary. 17. Place wire rack on top of large foil-lined cookie sheet. Place the bottom cake layer, cut-side up, on the wire rack. Assemble mini tortes in the following order: Bottom cake layer, melted glaze, unmelted filling. Repeat for middle cake layer. Only apply glaze on top layer. 18. Repeat step 17 to assemble remaining mini tortes. 19. Refrigerate for 20-30 minutes. Tidy work area. 20. In a medium saucepan, whisk the corn syrup with the rum and 2 tablespoons (30 milliliters) of water. Cook on medium-high heat until it is slightly thickened (1 minute or so). 21. Put the chocolate into small bowl and pour the mixture (corn syrup, rum, and water) into the chocolate. Whisk until the chocolate is smooth. 22. If the ganache looks too thick to pour, whisk in another tablespoon (15 milliliters) of hot water. Let the chocolate cool for a bit until it is only warm. 23. Scrape off any excess jam from the torte sides. Slowly pour half the warm ganache in the center of the cakes, allowing it to coat the tops and spread down the sides. Spread the ganache evenly on each torte. 24. 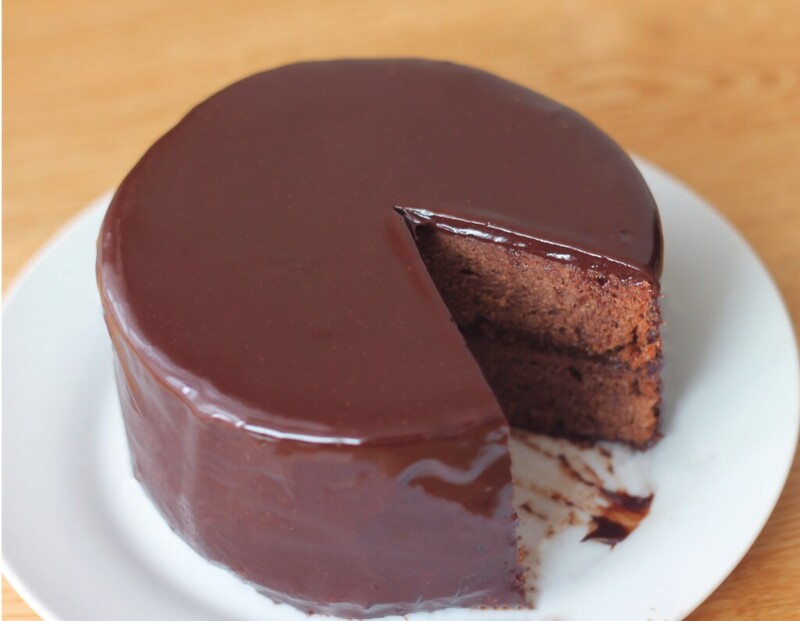 If the ganache cools down, microwave it for a few seconds and repeat coating the remaining tortes. Make sure it looks smooth. Remove the excess. 25. Refrigerate for at least 10 minutes to allow the ganache to set. And…voilà! You’re done! How did yours turn out? Now, if you’ll excuse me, I’m going to go stuff my face with yumminess. Send us pictures or post them on Instagram using #YattaTachiNoms. What anime food should we do next? Let us know in the comments below!